In Latest employment news RBI invites applications for officer posts Grade b posts. 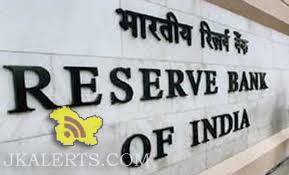 Reserve bank of India Recruitment for graduate candidates total 166 posts. 1). Profile Name: Officers Grade b. Number of Vacancies– 166 posts. Those who have 60% marks in graduation under any stream and belonging to General Category are eligible to apply for these posts. Candidates belonging to the SC/ST/PWD must have a graduation degree with 50% marks for applying this RBI Recruitment 2018. Those who have a master degree in one of the following subjects: “Economics / Econometrics / Quantitative Economics / Mathematical Economics / Integrated Economics Course/ Finance” with a minimum of 55% marks are eligible to apply this rbi recruitment. Those who have a master degree in one of the following subjects: “Statistics/ Mathematical Statistics/ Mathematical Economics/ Econometrics/ Statistics & Informatics” with 55% marks can apply for these posts. 3rd July 2018 is the Starting Date for applying. 23rd July 2018 is the last date for applying. (a) Candidates are required to apply only online using the website www.rbi.org.in . No other means /mode of application will be accepted.